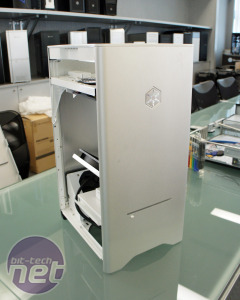 1 - SilverStone FT03: Jaw droppingly gorgeous 2 - FT03: Will upward facing work in a smaller design? 3 - SilverStone RV03: The Albino Edition 4 - SilverStone RV03 finishing touches 5 - Is champagne the right colour for the RV03? I'll come out and say it right away: SilverStone's FT03 is not even ready yet and it's already the most innovative and beautiful case we've seen in a long, long time. Seeing it for the first time resulted in one of those rare occasions where you just stand there and try to get your head around something - because of the orientation of the inside bits. Unfortunately in our haste for detailed pictures of how it all worked together we forgot to photograph the most important part: the outside, and how it looks with all the case sides on! Doh! Physically the third edition of the Fortress series is limited to micro ATX-motherboards, which will immediately scratch it off the shopping lists for quite a few of you. However, considering we have recommended and score highly as many quality micro-ATX boards as ATX: the Gigabyte H55-UD2H, P55M-UD2 and Asus Gene-series for example, there are certainly worthwhile build options out there. The new FT03 with front on, and off. 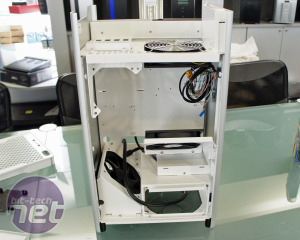 The FT03 follows in the footsteps of its FT02 and RV02 brothers in that it twists the motherboard so the rear ports and ventilation now face upwards. 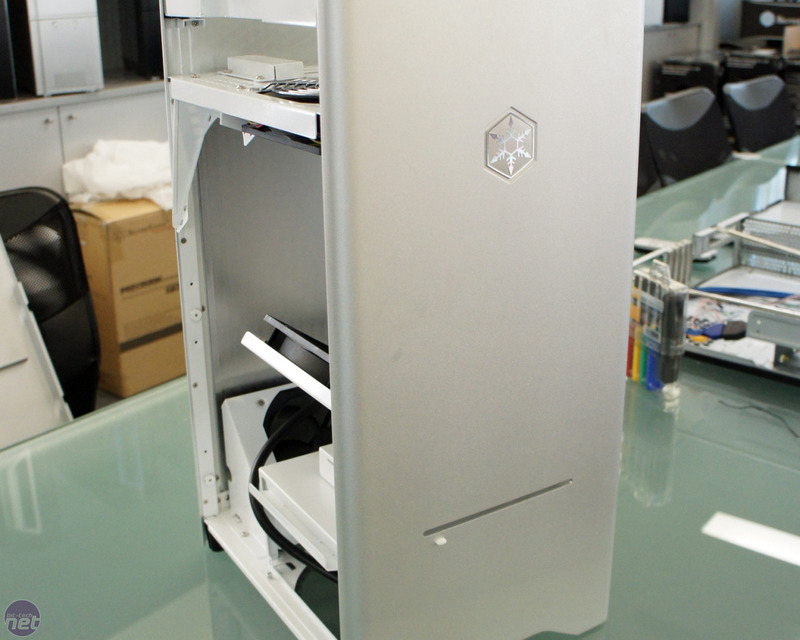 This has the advantage of leaving it perfectly flush on all sides, bar the small front slit for the optical drive. Because of this arrangement, SilverStone explained the considerable effort put into testing the case - including not only the positions of everything inside but things as fundamental as the size of the holes in the top grille which have been widened considerably, since the earlier Computex prototype, to minimise airflow restriction. Inside, SilverStone has also dropped the second removable hard drive bay and put an aluminium plate on the case side panel that makes contact with the remaining removable bay. Apparently this is because the additional drive bay caused overheating issues. 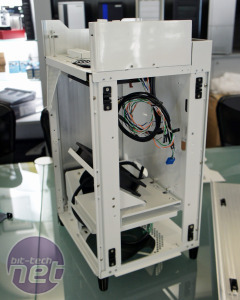 SilverStone assured us it won't release the case until its rectified the issue, although to be honest we're also concerned about vibrations transferring from the hard disk into the case and the potential of too much pressure on the hard drive lid. Also - how is it removable if it's being pressed down? The FT03 uses a mix of materials that balance cost and aesthetics - the inside is a steel construction but grille on the top is plastic. 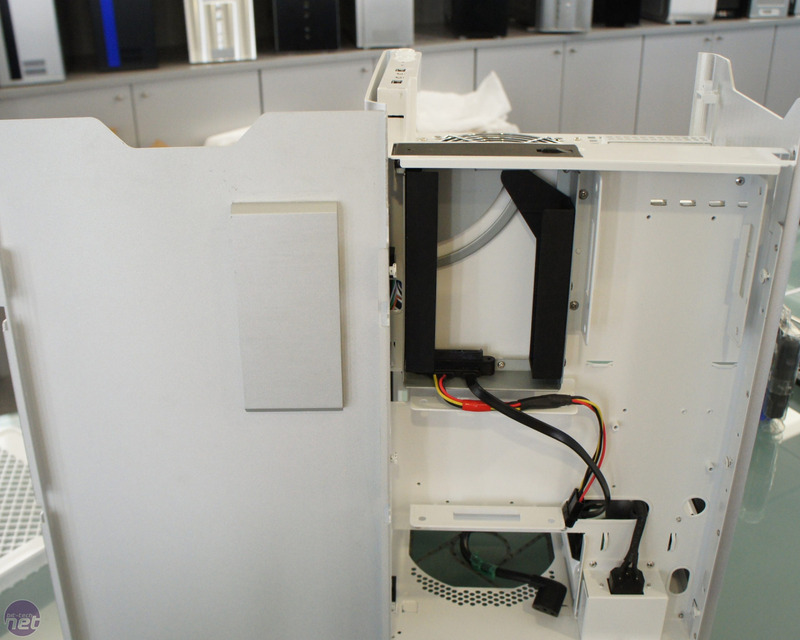 The sides, however, appear to be machined from a single block of aluminium and end up a similar thickness to current material used on Silverstone's TJ07/FT02 cases. This is slightly thicker and certainly stronger than what Lian Li uses and it doesn't flex. The side panels are simply clipped in, and pop off with a quick tug.